Fall for Some Autumn-Blooming Plants! I can’t believe this is the last weekend in August! Actually, I can, because fall is in the air. The past week or so, the mornings and nights have been much cooler. We are now in Indian Summer, and everybody’s gardens are winding down– veggies are being harvested, flowers are exhausting themselves. I look at pictures of my gardens in the early half of summer, and I’m sad to think it’s almost over. 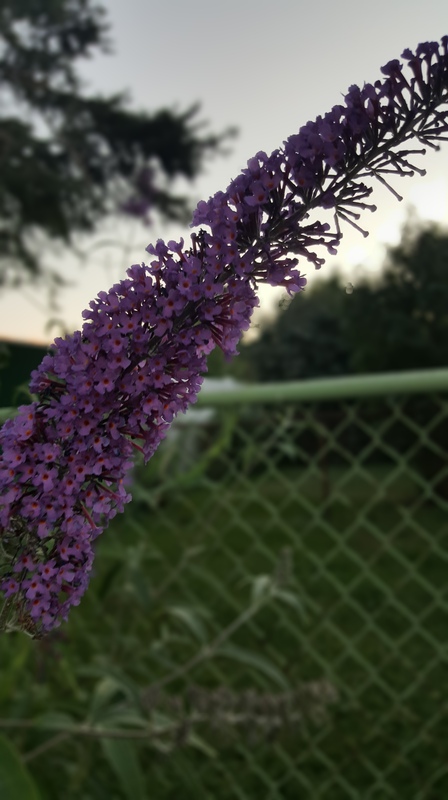 I can’t be too sad though– I do have to remember that I have a few fall-blooming plants that will keep that waning summer spark alive for just a little longer. I am constantly striving for a four season garden! Move over, mums and asters, there are a bunch of great plants for fall interest!!! 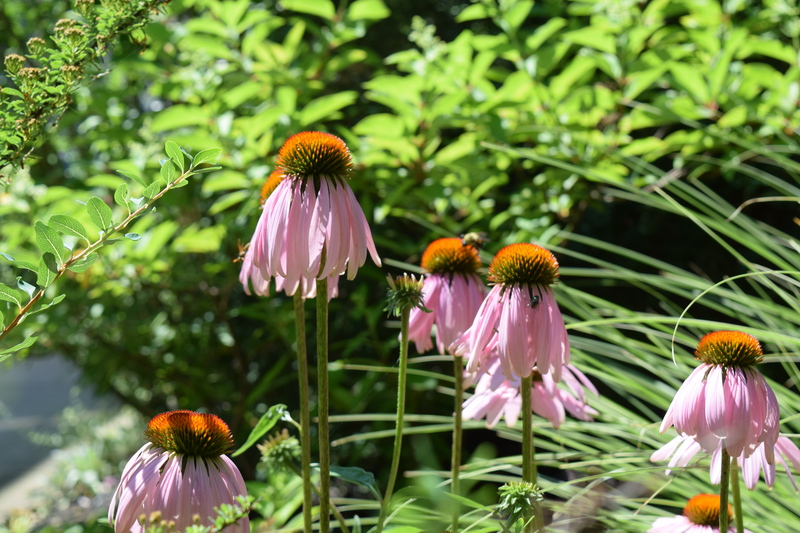 So, what are some fall blooming plants and flowers you should consider for your landscape? 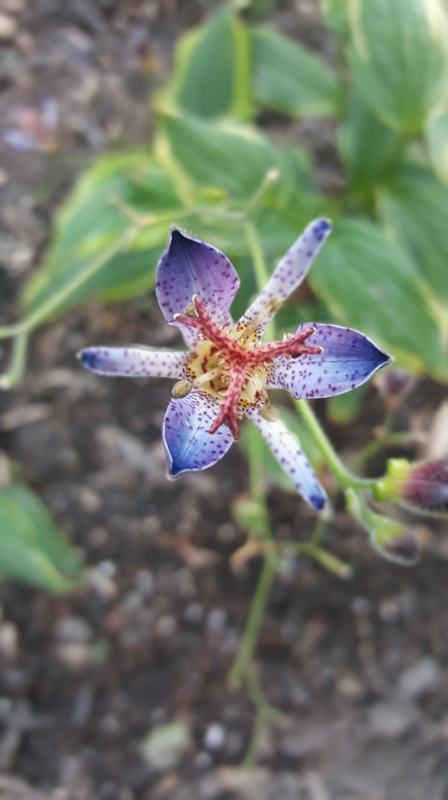 Toad Lily (above) – this is a beautiful orchid-like flower that blooms in later summer to early fall. I had been on the hunt for these and was lucky enough to find two different types. This will definitely give me something to swoon over for the fall season! Beautyberry — I LOVE this plant. I was so happy when I found it. This plant has these beautiful purple berries that develop during the fall. 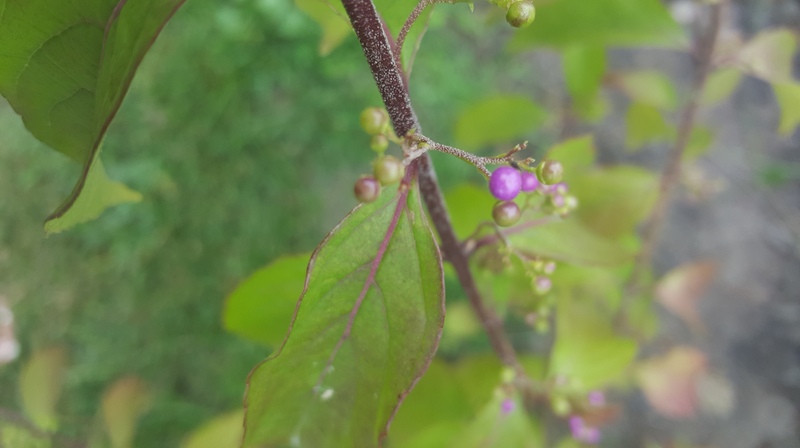 The berries on my plant have already started to turn purple! This is a great accent plant for any landscape! If there is one plant you should have for fall color, the beautyberry is it! Morning Glory- this beautiful annual vine is just about ready to bloom for me. 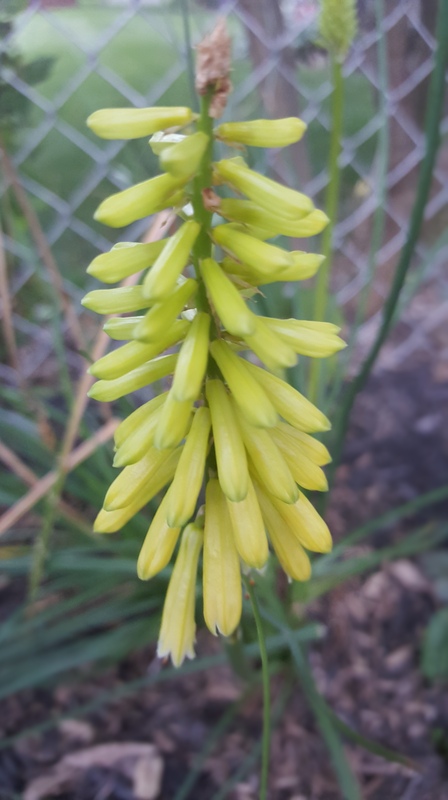 They tend to bloom in late summer to early fall. I can’t wait to see this beauty. **Something to consider when it comes to a four season garden is using then same “venue” for climbing plants such as the Morning Glory. 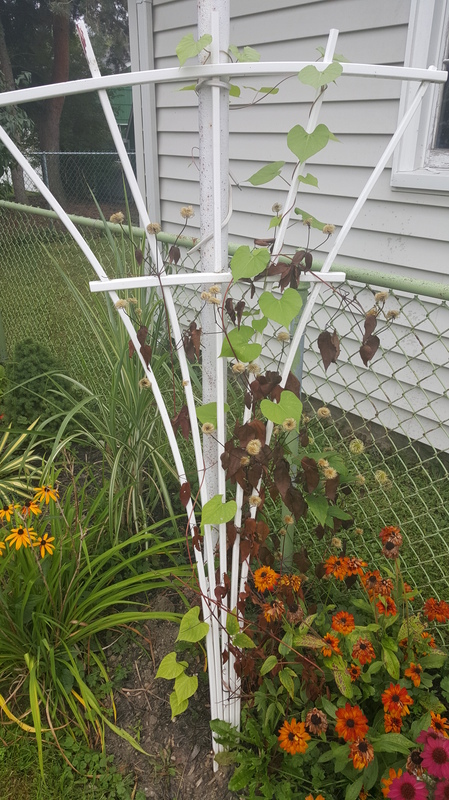 Now that my Clematis has exhausted itself, I planted Morning Glory seeds behind the trellis I had for it. 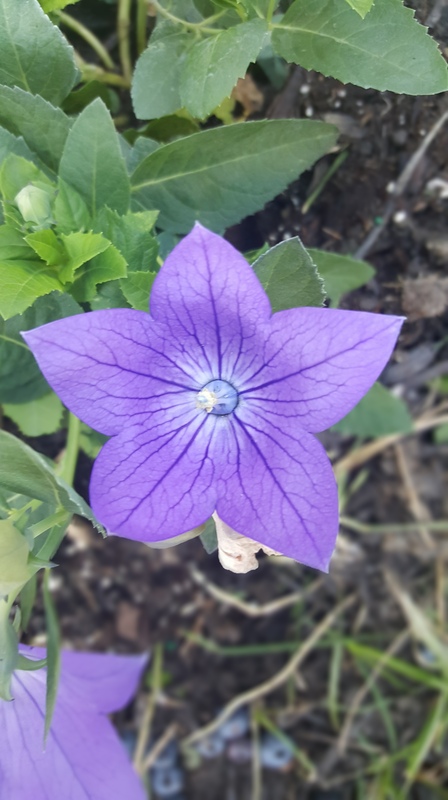 I now have a Clematis for the summer and a Morning Glory for the fall– I will always have a visual interest in that spot. As one vine dies away for the season, another one is ready to bloom! Japanese Maple – I own two different types of these trees, and the one thing you can count on for this tree is great fall foliage. If you have a small yard like me, These trees are the way to go! 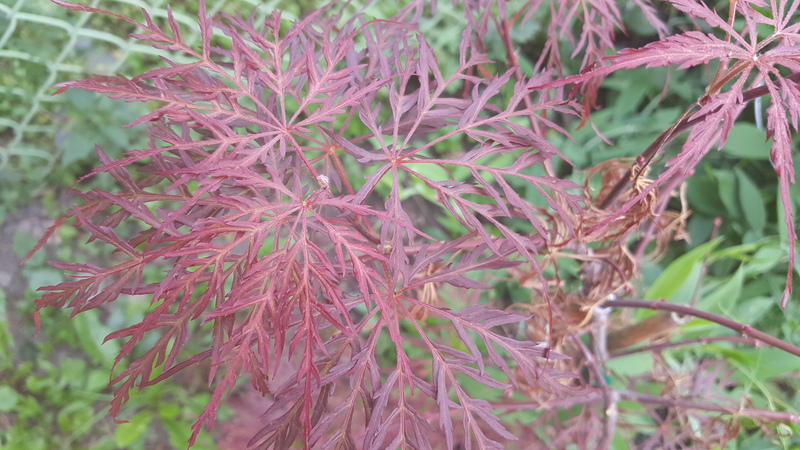 I am so happy my little Crimson Queen Japanese Maple has leaves again! It was fried in the sun when construction started on my house. 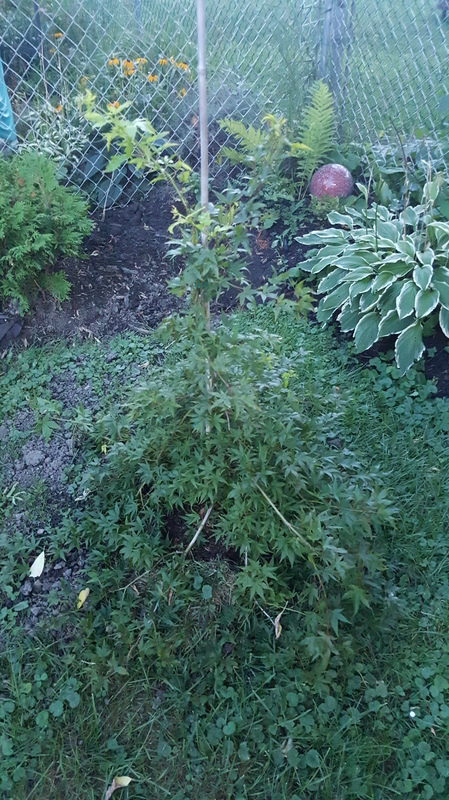 My little fried Japanese Maple came back to life with beautiful red leaves! Monkshood — beautiful, showy blooms, but a very poisonous plant. I am looking into purchasing one of these if I can find it! Oak-leafed Hydrangea — the hydrangea is a beautiful plant to begin with, but add some beautiful leaves that turn a bright orange during the fall, and you have showstopper as part of your “yard-scape”. 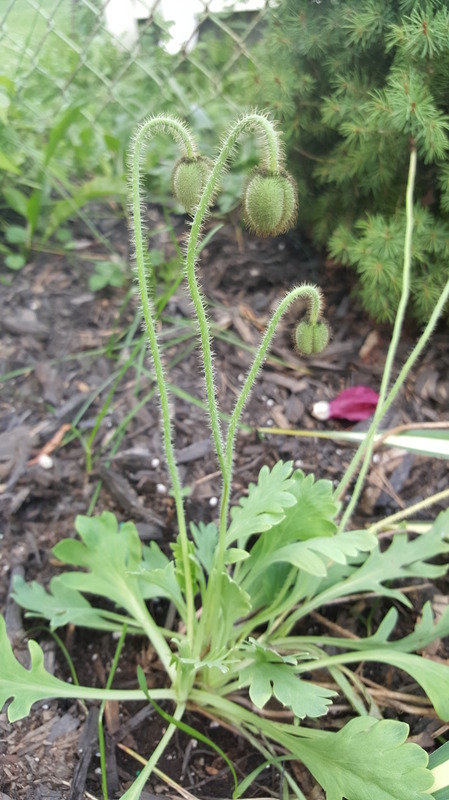 Japanese Anemone/Fall-Blooming Anemones — it may take a year or two for these plants to get established, but when they do, it will be worth it! They love part sun and will become a 12-inch ground cover. Sugar Maple — These big shade trees have the most beautiful colors. Goldenrod– you aren’t allergic to this. You are allergic to the ragweed that happens to come out at this time, but does not flower. Sedum— I have the Autumn Joy Sedum and the unique texture of this adds a different element to your garden. 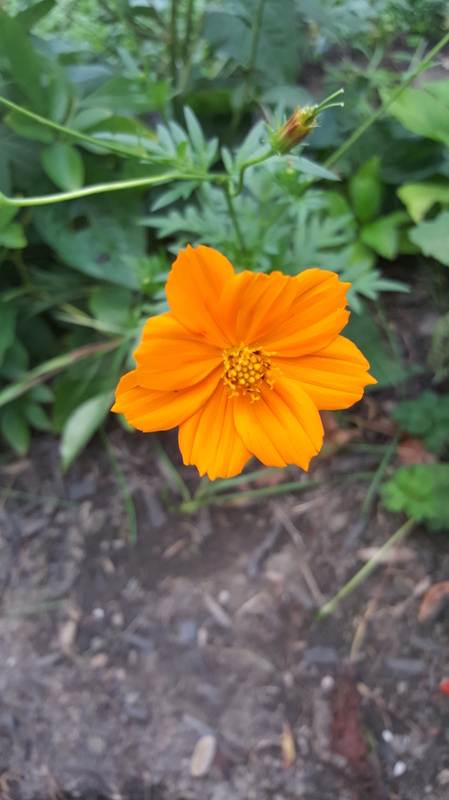 There are many more fall blooming plants out there that I have listed, or don’t even know exist, but what every single one of them will do for you is bring you great joy right up to winter! It’s been quite a while since I last posted. I was out-of-town last week— my little brother got married, so that was our “vacation” for the year. 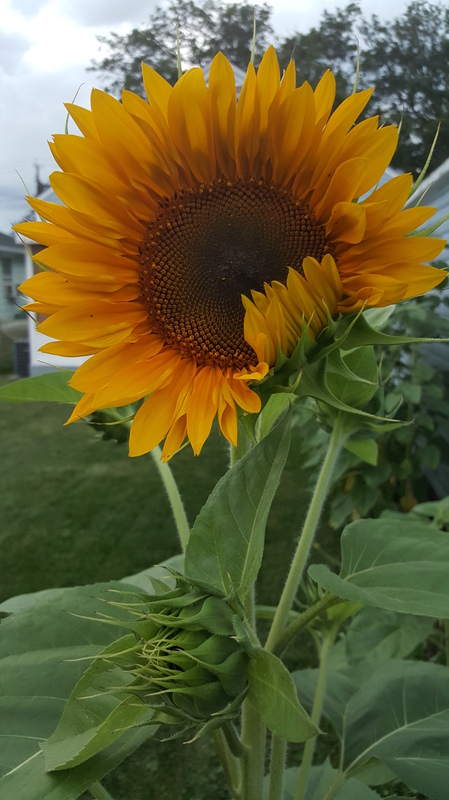 So, while I will post about the wedding venue in a later post, I thought I would share some great pictures of my garden nearing the end of summer. Enjoy. The blooms of the season. 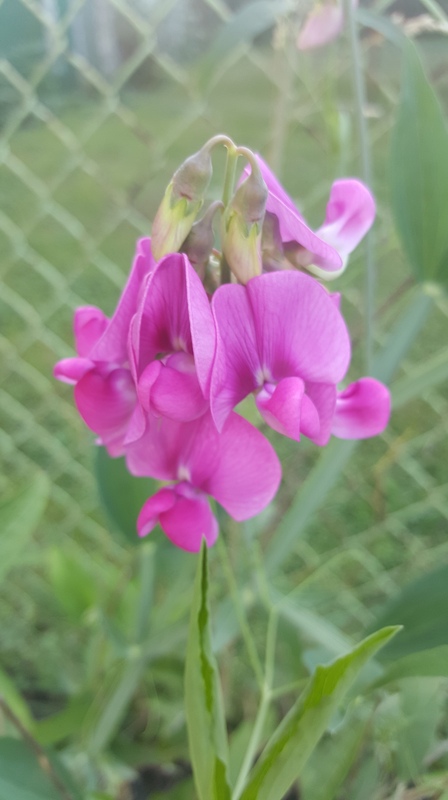 Sweet pea. Enjoy! I thought I would try something a little new with this post. There are so many things that interest me and I would really like to share them with you! My wish list for Christmas is getting longer (I know…too soon? ), but it looks as though I may have to break down and buy a few of these things before then. I have also found some really well written articles I thought I would pass along for your reference. 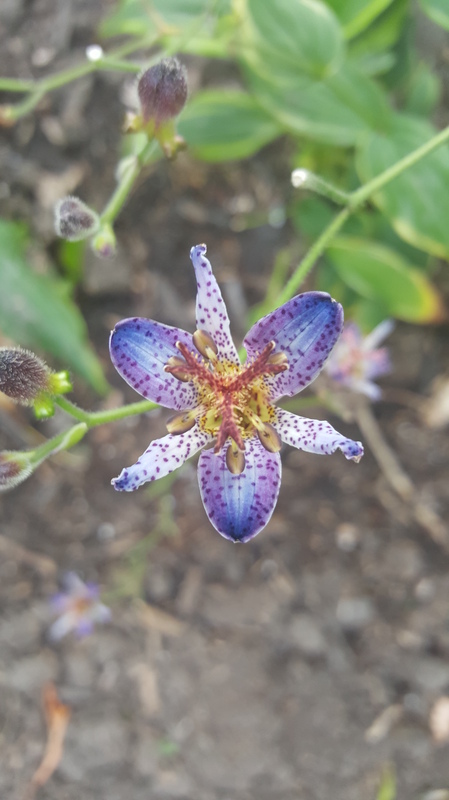 The Talk of the Trowel: this will be a new periodic post that will bring together some of the best gardening information the interwebs (ha) has to offer. I want to share with you things that I like, love and want this very moment! This tulip shaped trowel was a big hit at the Chelsea Flower Show this year, and I can see why! You can purchase this beauty on a great gardening site called shopterrain.com. Beautiful products for all of your outdoor musings. Modernfarmer.com has the best garden tool set ever! This kit includes scissors, which I find I need a lot more than I ever thought I would! Basil Memories Bottle Basket — Basil Bike Baskets are some of the most well designed baskets around. I own two of them– I just recently purchased this yellow one to put on my bike so when I head to my local Farmer’s Market, I have a place to put all of my loot! Here it is, my list of things I love right now. I hope you enjoy them as much as I do! Stay tuned for more great ideas, gadgets, gear, etc.! 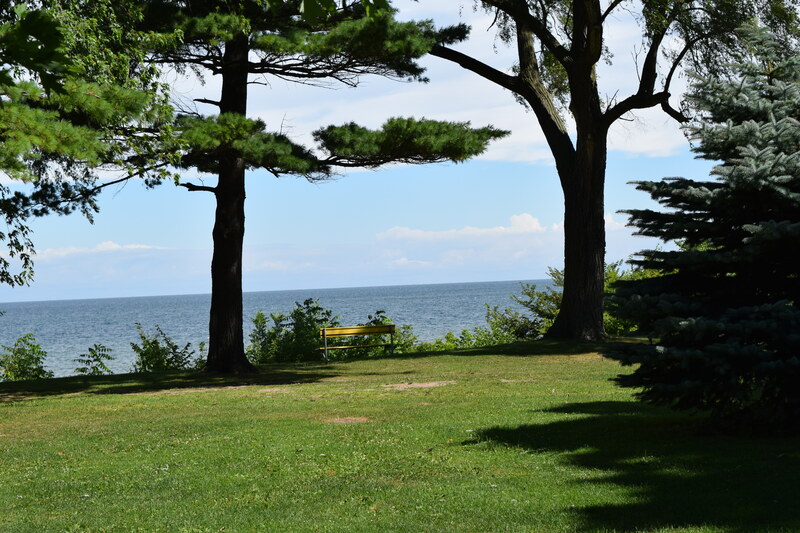 I spent the day yesterday with my daughter at Olcott Beach in Olcott, NY. 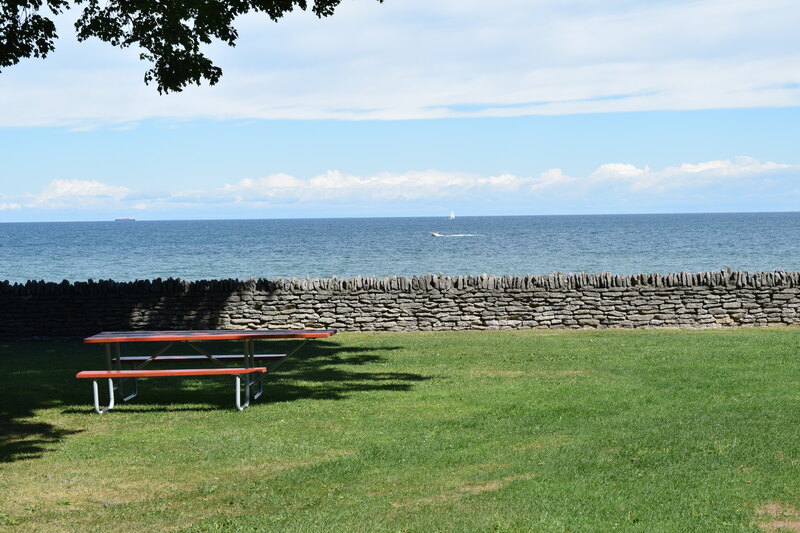 It was a wonderful day, and I couldn’t help but take some pictures of beautiful Lake Ontario. Enjoy. It’s August, people!! I hope you are having a great summer! I can’t complain– we have done a lot of stuff this summer, but my family still has a few things to check off the list before I can officially call it a completely fun-filled summer. Garden wise, I have been watering like crazy. We had 90+ degree temps (32 Celsius) last week, and everything was withering under the hot, oppressive sun. We still haven’t received any real rain, other than the big thunderstorm that came through my neck of the woods on Saturday. I have been quite busy with all the stuff that’s happening with our house. As I have mentioned in past posts, we are getting some major remodeling done, and unfortunately, my flower beds have taken a toll. With the house being re-sided, ladders and lots of feet had pretty much trampled down my front garden beds, leaving me very sad. I know, however that this was bound to happen, and I know that next year everything will come back even bigger and stronger! Well, my beds out back of my garage have taken the biggest hit. 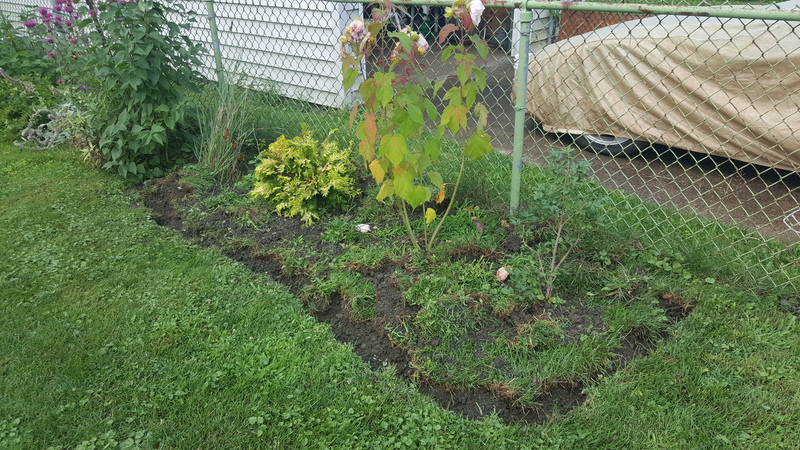 So, I quickly moved everything over to the other side of my yard and extended my flower beds once again. I actually like that I have moved everything, and it looks as though my dwarf burning bush is doing much better in its new location than the previous one. Here it is, my quick emergency bed to save everything from getting trampled! I have since done some work on it to make it look prettier, but as usual, I have a long way to go. 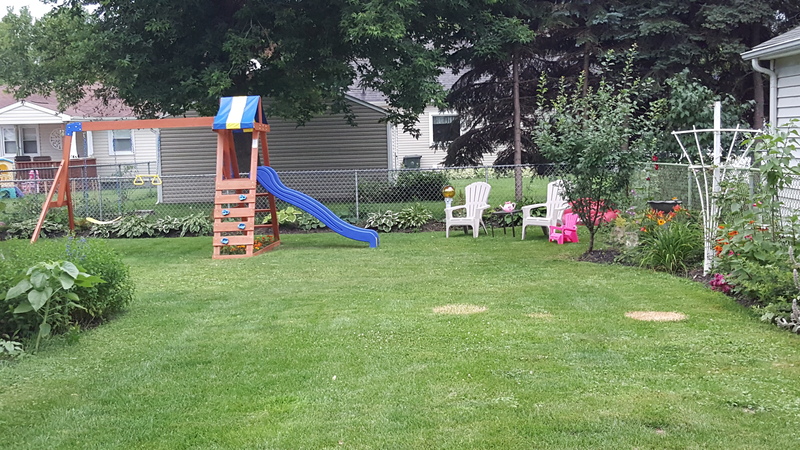 After surveying my back yard landscape, I knew I needed to add something to it besides just flowers, plants, and shrubs. It was an absolute “tree”t to see that there were a lot of great trees on sale at my local nurseries right now. I have since bought three! To keep your landscape interesting, think about adding some trees to the picture. Keep in mind the size of your yard, and there is a tree out there for every landscape, from postage stamp size to major acreage! When looking for some trees to put in your yard, try to find some different varieties that you don’t often see. For example, if you have a larger yard, get a beautiful tulip tree, or a variety of maple that isn’t as common. For small yards like mine, you can pick from a large list of Japanese maples, or other ornamental or dwarf size trees. Location is key. Make sure wherever you plant your tree, you have given it room to grow. Or, maybe you want some privacy in your yard, so you will plant it to accommodate this. I am now filling in the rest of my yard with a few trees that get about 8-10ft tall. Japanese Maples — 50% off right now at your local nurseries. I purchased a Crimson Queen (that unfortunately was put into the hot sun during the beginning phases of our home remodel, and the leaves dried up to a crisp). PLEASE DO NOT JUDGE ME. I am trying really hard to bring this little guy back, and it’s working, his regular leaves are coming back. They are reddish/green laceleaves– so intricate and beautiful! Crimson Queen Laceleaf, a little fried. 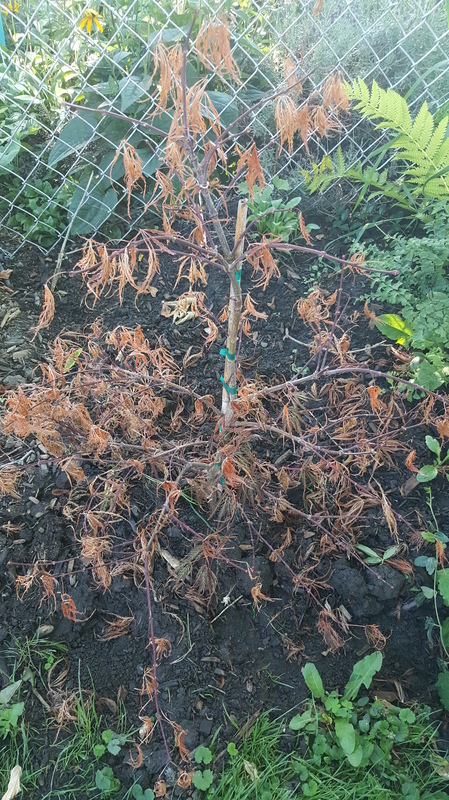 The other tree I purchased was a Ryusen Weeping Japanese Maple. The tree, as I am told, is a very rare weeping Japanese Maple that grows much faster compared to most other varieties of this tree. It averages about 10ft. high, but can grow as high as 20ft. It looks like a waterfall when fully grown. I really love “weeping” plants and trees. They are so different, yet dramatic and graceful. 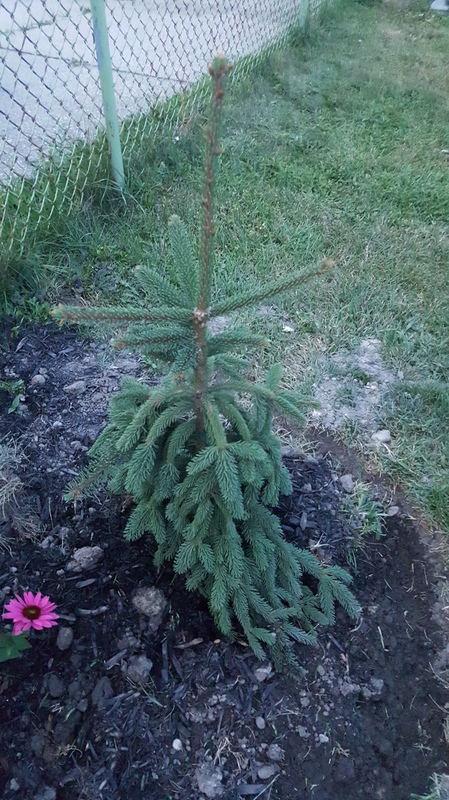 Another “weeping” specimen I purchased was this Weeping Norway Spruce. They get to about 8 ft. tall. Just perfect for my yard. There are many different trees to choose from, take your time and research some that are perfect for your part of the world. 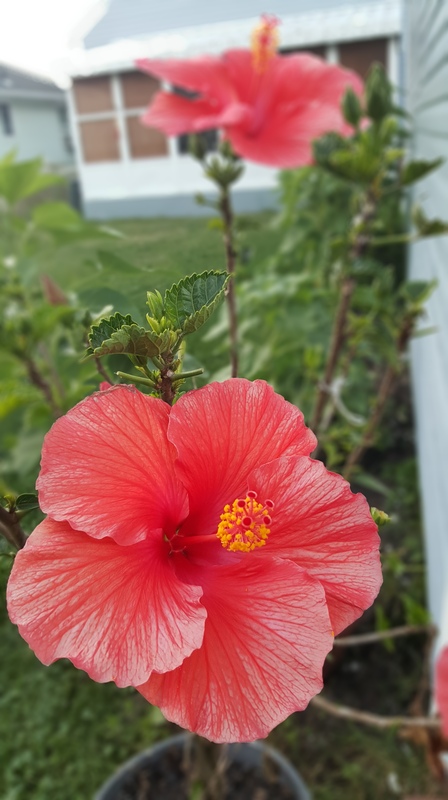 Adding trees to your flower beds makes your garden more well-rounded and lovely!